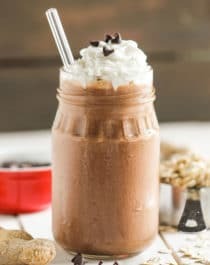 Made with cocoa, peanut butter flour and other healthy ingredients, you'll get a healthy serving of fiber, protein, antioxidants, vitamins and minerals in this Healthy Chocolate Peanut Butter Oatmeal Smoothie. Plus, it's rich, creamy, sweet, and satisfying! Add all of the ingredients to a blender and puree until completely smooth. This smoothie thickens the longer it sits, so I recommend refrigerating overnight for a super thick texture. If you don't want to wait, simply blend in a handful of ice cubes and puree until completely smooth.